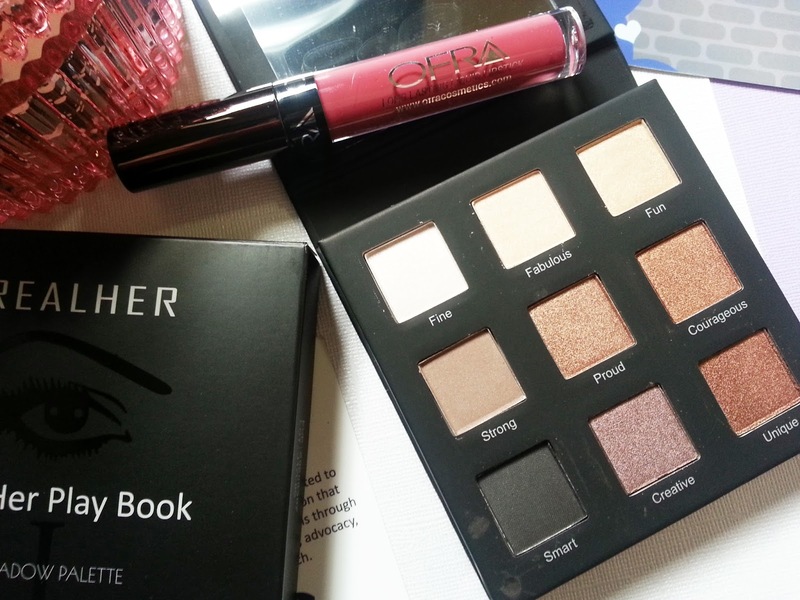 Every Boxycharm subscriber received a RealHer Eyeshadow Palette in their June box. I received palette 1 (along with many other Canadians) which is named Be Your Own Kind Of Beauty. I've never tried RealHer shadows before, so I was excited to give this palette a try! I came up with three different looks. 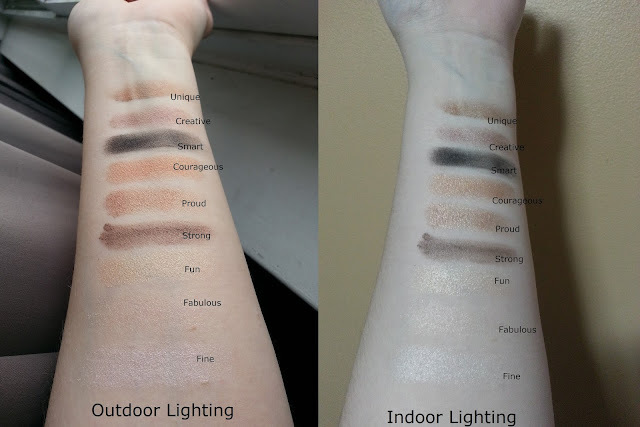 I did an arm swatch showing what the colours look like using outdoor lighting, and another with indoor lighting. They do look a tad different, but over all very similar outdoors and indoors. I wanted to try a lighter eye colour when first trying out this palette. For this look I used Strong in my crease, I used Fun as my lid colour, and then I used Creative as a liner instead of using another product. I used Fine in my inner corners. I liked this for a simple day look, for a little wash of colour on the eyes. I tried to darken it up a little more from the first look, and use different shadows than the first as well. In this look I used Strong in the crease, Proud in the outer V, I mixed together Fabulous and Fun for my lid. I also brought Fun into my inner corner and about to the middle of my lower lash line, and Proud for the other/outer half of my lower lash line. Also on my face: Smashbox Photo Finish Primer Water, Make Up For Ever Water Blend Face & Body Foundation in R210, MAC Cosmetics Studio Fix Powder Plus Foundation in NW15, Kat Von D Tattoo Liner in Trooper, Eyeko Black Magic Mascara, Nars Radiant Creamy Concealer in Chantilly, Essence Cosmetics Make Me Brow Eyebrow Gel in Browny Brows, Tarte Blush in Tipsy, TheFaceShop Creamy Lipliner in Beige Garden, Bare Minerals Marvelous Moxie Lipstick in Get Ready. I wanted to do a deeper, smokier look to see how those shadows would blend together. So in this last look I used Strong in the crease. I then darkened my outer V using Unique. To make it even more smoked out, I used Smart in the outer V as well as bringing it lightly up into my crease. I patted Fabulous onto my lid, and brought it to my inner corners, and continued it to about a third of the way on my lower lash line. Also on the lower lash line in the middle section is Unique, followed by Smart in the outer section of my lower lash line. Also on my face: Smashbox Photo Finish Primer Water, Tarte Shape Tape Concealer in Fair, Make Up For Ever Water Blend Face & Body Foundation in R210, Kat Von D Ink Liner in Trooper, Eyeko Black Magic Mascara, Essence Cosmetics Make Me Brow Eyebrow Gel in Browny Brows, OFRA Cosmetics Long Lasting Liquid Lipstick in Santa Ana, Milani Blush in Dolce Pink. I know I wanted to use different colours but Strong is literally the only matte in this palette besides black, so that is why it's in every look. This palette would be okay to travel with instead of bringing a more expensive palette that could possibly break. I'm disappointed that there are only two matte shades as well. One works for the crease, but that's about it. Black isn't always used in eyeshadow looks, but it is welcomed in a palette. I wish there were at least one white, or champagne matte colour to use under the brow bone. Sometimes you just feel like using matte shadows as well, and this is mostly shimmer. The shadows feel creamy when you are swatching them, and do blend nicely as well. There is fall out when dipping your brushes into the palette. I did notice some fall out on my face as well with the darker colours, mostly the black (Smart) shade. Would I run out and repurchase this if I ever finished it? No - I have other palettes I reach for more often, and prefer their quality over this one. But as a beginner, or a travel palette, it is handy and does the basic eye look.